The first time I entered a Japanese super market I was truly shocked, shocked with the min availability of familiar vegetables, shocked with the many many colourful fruits that I wanted to touch and smell and bake with buit the biggest shock came in the form of price. Never in my life I saw potatoes being sold on piece basis, that too at a hopping price of 50 yen for a regular size one. But with time that initial shock made way for a certain excitement. To try new veggies, make familiar curries with them or prepare something new that we liked in the restaurants. They say when in Rome, do as the Romans do but I preferred to change it a little bit and tried Indianising many of these Japanese vegetables. This kamal kakdi or lotus root was one of them that I was excited to buy. Though these are pretty common in certain parts of India but I never got any chance to taste or cook with them. 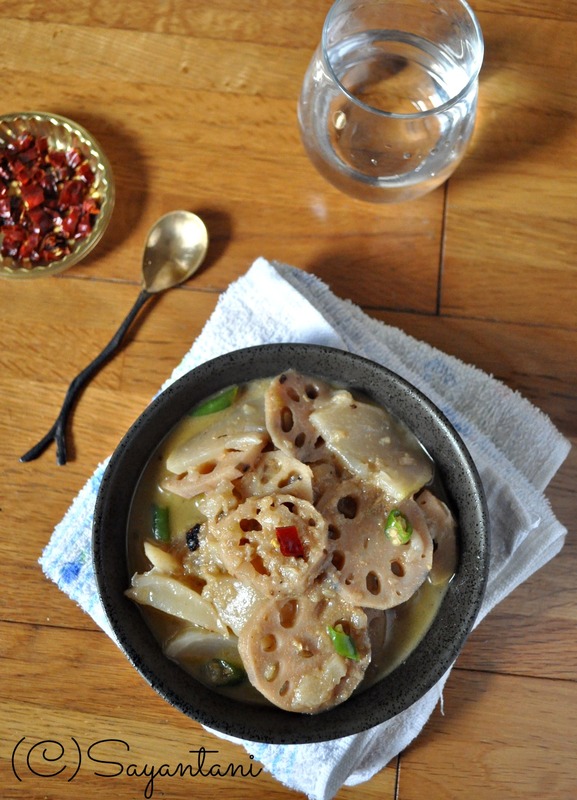 The recipe that I had in mind was gogji nadir, a very simple turnip and lotus root curry from Kashmir. I first saw it at one of my most favourite blogs, mad tea party, and had this bookmarked a long long time back. But at the same time I was sure the father son duo at home would never like such a simple curry so I just had to twist the recipe a little bit. The result was really soul soothing. Its one of those dishes that you can call soul food or comfort food. Very aromatic and light but never fails to satisfy all your taste buds. Little R loved this dish mainly because of its texture. He is at an age where everything unique has an appeal. He loved the holes in the lotus roots and insisted to have it frequently. Given the easy availability and nutritional values of this vegetable am happy to oblige. Here is the simple recipe. Wash the lotus roots under running water. Here they were very clean but due to the holes in it dirt might get clogged. So be careful and was it thoroughly. Peel the skin lightly and slice in medium thick slice, ¼”. Wash again if you see dirt and keep submerged in water or they will turn black. Similarly cut off the top green part and the root part little bit. Wash under running water. Cut in half and then thickly slice the turnip (I used the white variety). In a small bowl mix the ginger paste and coriander powder with 2 tbsp water. Keep aside. 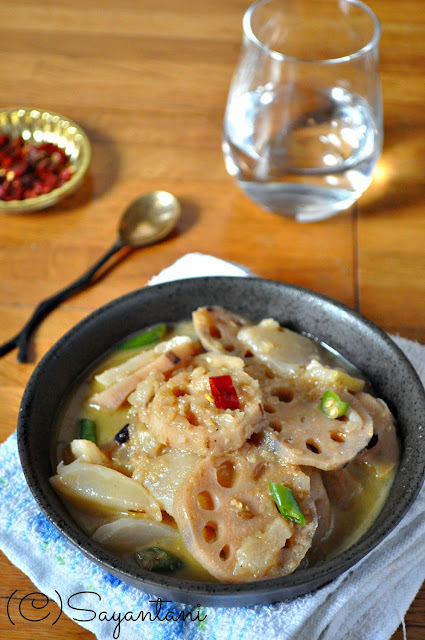 Heat ½ tsp oil in a pan and add the lotus roots. Sprinkle little salt and fry on medium for 3-4 minutes. Keep stirring to fry it uniformly. take out ad keep aside. Do the same with the turnips as well. But fry it for a couple of minutes only. Heat the rest of the oil and add chopped green chilies and cloves when they start to splutter add the hing. Stir and add the chopped onion. Fry on medium with a pinch of salt unless they become translucent (5-6 minutes). Mix in the spice paste and cook on low till a nice roasted aroma of spices wafts out (another couple of minutes). Beat the yogurt with a fork till smooth. Lower the flame and carefully add to the pan. Mix in gently cook for another 2-3 minutes or till oil starts to separate at the side. Add the fried lotus roots ix in and then add 11/2 cups of water. Taste and adjust the salt and tighten the lid. Cook on medium flame for upto 2 whistles. let the steam dissipate in itself. Open the lid and then add the turnips. Cook for 5-7 minutes till the turnips soften ad start to disintegrate. 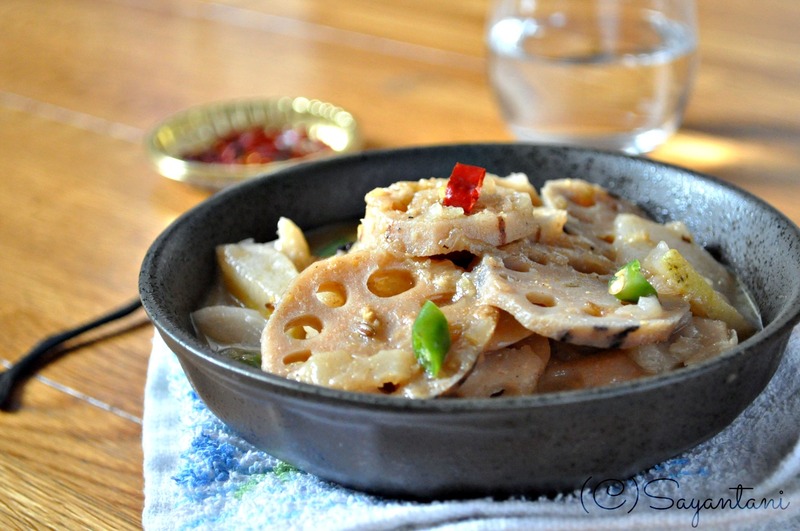 Dolly's Lotus root with potatoes. I have never myself eaten lotus roots but it sure looks pretty appetising. This is yummy and a very frequent curry soup in my home. Just last week I met Anita at ITC and told her how I love this recipe of hers'. This curry tastes great with knol khol as well. Can guess ur reaction, even it happened to me when i entered the first time to a french farmer's market. Curry sounds fabulous and delicious. in kerala, they boil the sliced lotus root in water in which just salt is added. it is then dried in the sun for three days and stored. it is then deep fried. it is a special palakkad crispy. very tasty. Really attractive curry. I have never tried Lotus root but very tempted. Very unique side dish ..cute picture. Sayantani, the Curry looks so delicious and comforting. Will surely try it. Clicks are tempting as always. Good to see you adapting so well with a new country, new culture and yes the PRICE SHOCK. You just work around it and make the most with what you have, which you are are doing so well. Thanks for the kind mention. Appreciate it. This is superbly stunning. Great recipe and bookmarked for this weekend's meal. Never tried lotus roots before, but this looks tempting! Lovely post! Looks very interesting, must try.